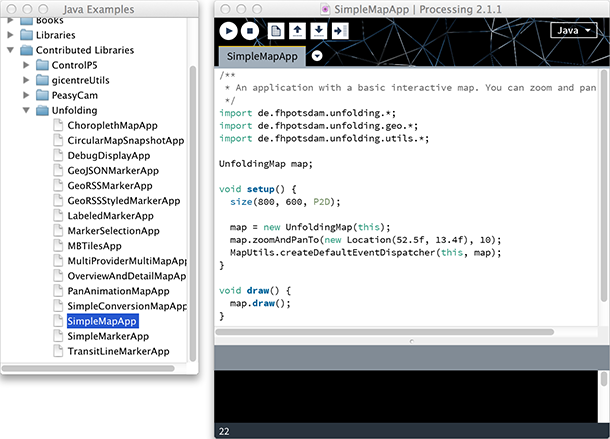 This introduction covers the setup of the Unfolding library in Processing and the first simple map. Download the latest version of the Unfolding library. Unzip the archive and put the extracted Unfolding folder into the libraries folder of your Processing sketches. To find the Processing sketches location on your computer, open the Preferences window of the Processing application and look for the “Sketchbook location” item at the top. You will need to create the “libraries” folder if this is your first contributed library. 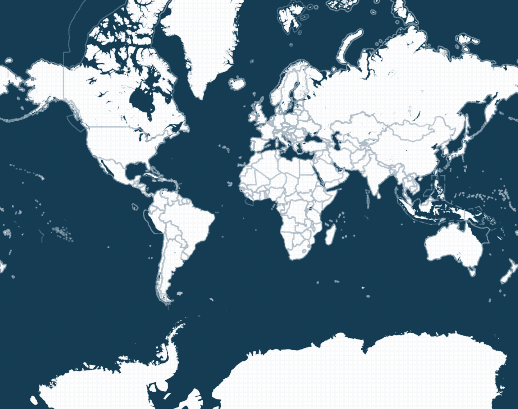 Restart Processing, start a new sketch and create your first simple map. To get started, you need to include the Unfolding library via Sketch » Import Library and put the import statements at the top of your code. Create a reference to a “Map” object, i.e. Initialize a new map object and add the default event function for basic interaction (double-click to zoom and drag to pan the map). Once you’ve done this you can begin to draw the map and run the sketch. That’s it. Now you are all set up, and good to go! Check out our other tutorials, and don’t forget to browse through the examples. It might be a good idea to increase the memory for Unfolding applications. For this, go to the Processing Preferences, check the box next to “Increase maximum available memory” and enter an amount, e.g. 1024 MB. © 2014 – Unfolding Maps by Till Nagel and contributors. Developed at Interaction Design Lab Potsdam, KU Leuven, and MIT Senseable City Lab.